removed or rewritten and I have placed the old one here for reference. Nightnews supported many of these with publicity and other help. Retro Showgirls and Gothic Vaudeville act! 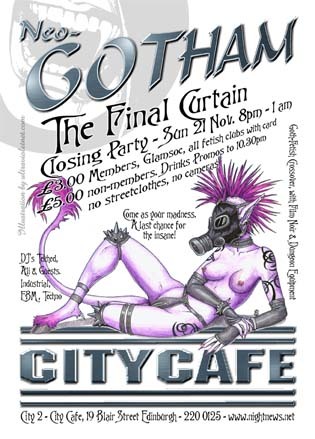 ..more stalls on the night so bring spare cash..
fetish play-clubs and furniture suppliers. Not one to miss. launch of a new Under-18's Club Charter in Edinburgh. DKY was de-listed 6 months after they started because they complained that their listing was sent to Scotsgay. 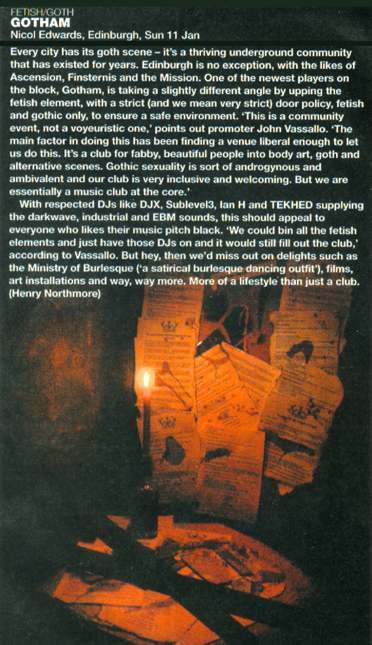 All our listings went to Scotsgay and no other promoter has ever complained about it. Homophobes or just stupid retards? You decide! 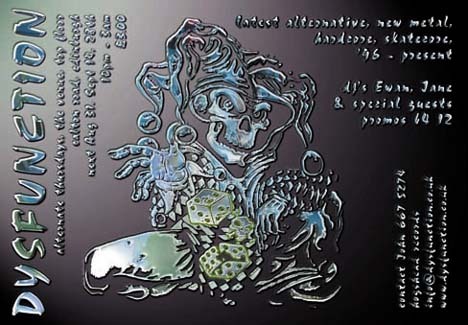 The Last Days Of Jesus Gig :: Underworld - April 2003.
the WGT Leipzig & The Castle Party Bolkow. 3 Days, 8 Bands, 6 Clubs, 3 Club Rooms, Fringe Events, Stalls, Bazaar. 45 Candlemaker Row from Jan 17th. Group / club / society discount: buy 10 get 1 free! 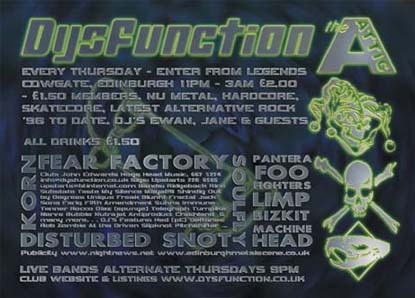 Pre Club / Club Night, Saturdays July and August 2002!! 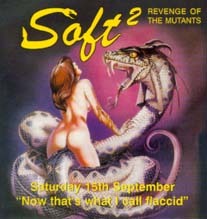 Continued Sat 3rd Aug, Sat 10th Aug, Sat 17th Aug, Sat 24th Aug.
sound system is wired up, till late.. Studio 24, Calton Road, Edinburgh. 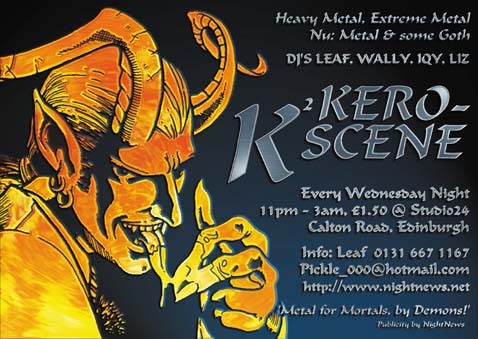 A monthly end of week club from the makers of Kero-scene K2 The music policy is Heavy Metal, Nu:Metal, Rock, Extreme-Metal and some Goth. ex Major City Ska night! 27 - 31 West Port, 9 - 1am. Full PA, Dysfunction and guest DJ's. 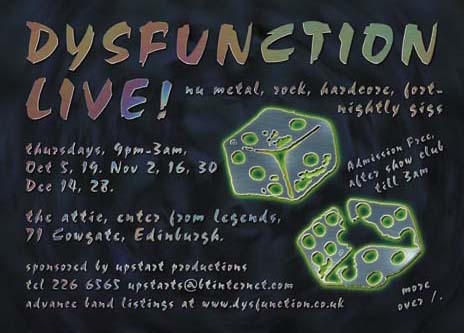 Dysfunction Club marketing, venue arrangements at The Attic, artwork, listings, press and the website below was by Nightnews from October 2000 - July 2001..
or £1.50 to EDGAR members. Also DJ's Lee & Jane, plus guests. 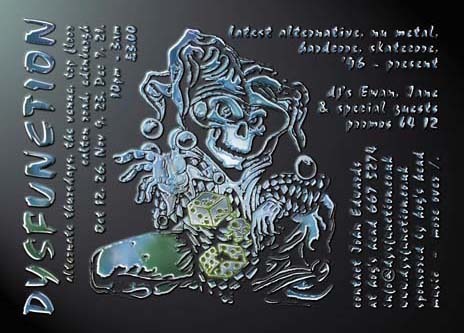 Dial 1 to 7 for some old flyers! 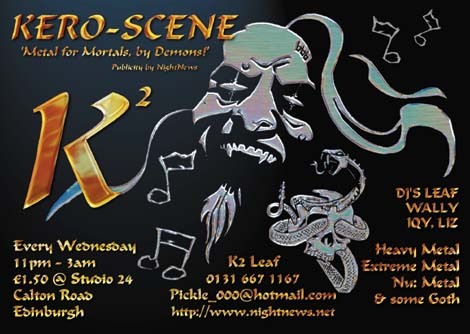 Smoke: new music from Glasgow and beyond - 19 band project, bands with active websites as follows..